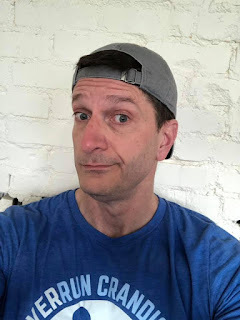 NoFo: Am I a backward-baseball-cap kind of guy? Because I’ve never thought I could pull the look off. Am I a backward-baseball-cap kind of guy? Because I’ve never thought I could pull the look off. But the choreography at today's 9 to 5 rehearsal has a lot of port de bras (movement of the arms) that keeps knocking it (the cap) off my head (tête) (or cabeza) (or noggin). And I have five-alarm (humanity-endangering) hat hair, so I really have no choice but to keep it (the cap) on in some position.